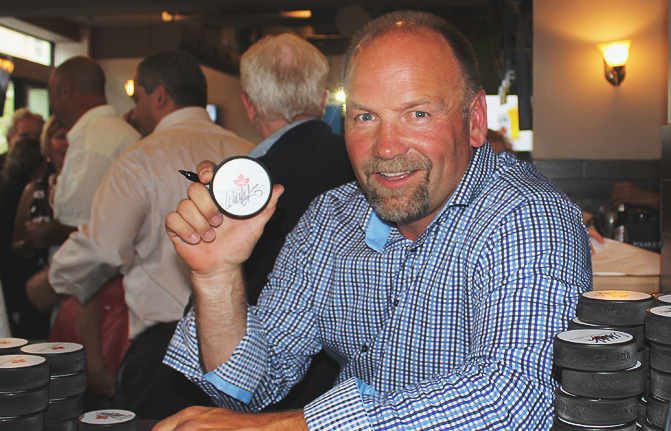 Former Captain of the Toronto Maple Leafs Wendel Clark will be in Brampton today to kick off the Brampton Celebrity Hockey Classic. The Celebrity Hockey Classic Series is a two- or three-game tournament that offers hockey enthusiasts the chance to play with former NHL alumni in support of Easter Seals Kids. Teams raise money for the chance to have the first pick of which NHL greats they want to play with. Previous Celebrity Hockey Classic tournaments have included former players like Doug Gilmour, Eric Lindros, Brad May, Rick Vaive, Kris King, and more. Clark, along with members of the Easters Seals Kids team and Mayor Patrick Brown, will be at his namesake restaurant Wendel Clark’s, located at 36 Main Street North in downtown Brampton at 12:15 p.m. for the kickoff. The Brampton Celebrity Hockey Classic will take place on May 16th at the Cassie Campbell Community Centre.